Let me preface this by saying that these people have been nothing less than a giant pain in my… neck. It appears that the Walkers didn’t really associate much later in life and talked to each other rarely. Most of them were deceased by the time I started to pay attention to family things in the mid-1960s. My cousins literally had no idea that the man who lived two doors away from them when they were children was their grandfather’s brother. It’s possible that once Nannie Walker was no longer alive to tell them to get along, many of her children simply stopped doing so. It’s much more likely that once they moved out of the old neighborhood and their children married and produced grandchildren, they simply didn’t get drawn together as they had before. What is clear, is that with the aging and subsequent deaths of most of Nannie and William’s grandchildren, information about their parents and cousins was much harder to come by. William Z and Nannie had nine known children – enough for their own baseball team: William Leslie, Eleanor Mary, Edna, Frank Orme, John E., William Harry, Ralph, William, Marion Edith, and Ruth. In 1900 Nannie Walker stated that she has had 7 children, 5 of whom are living – on the page are Leslie, Eleanor, Edna, John, and Harry – deceased would be Frank and Ralph. Marion and Ruth were not yet born. All children appear on a family bible page, some are in the Philadelphia Birth Registrations, and some have their birth recorded at the time of their baptism. I have a copy of a family bible page from my grandmother’s papers that listed the birth dates of all nine Walker children.1 My grandmother told me that the page was all some of the kids (including my grandfather Harry) had for proof of birth. Those birth dates match the birth dates found for some of the children in the baptismal records from the Church of Redemption. Not all the children were baptized in the same church, some were baptized in groups as older children, and some weren’t baptized at all. The bible record appears to be a copy made at a later date as the information is all done in the same hand and in a consistent manner. Here’s what we (my cousin Jamie – an incredibly talented researcher – and I) can currently prove. Any help in filling in the blanks is appreciated. I’ve sourced the children here, but not the grandchildren. Those sources are available on the BurgraffScott tree on Ancestry and will eventually appear on Family Search. 1. Madeline Marion Walker – born 21 Jan 1922 in Cook County, Illinois, baptized 12 Dec 1934 in the Church of the Redemption, Philadelphia. Madeline married Joseph E. Rocke (1917-1988) and died 24 Oct 2009 in Warminster, Buck, Pennsylvania. 2. Leslie Jeanne Walker – born 15 Dec 1924 in Cook County, Illinois, baptized 12 Dec 1934 in the Church of the Redemption, Philadelphia. Jeanne married Clement Aloysius Paff, Sr. (1924-1989) and died 5 Jun 2010 in Levittown, Bucks, Pennsylvania. 1. Janice Elizabeth Hirst – born 17 Mar 1923 in Camden County, New Jersey. Janice was a nurse in the U.S. Army. She died at Fitzsimmons Army Hospital in Denver, Colorado, on 15 Aug 1946. She was returned to her family in New Jersey and interred in Harleigh Cemetery. Edna Walker. Per the family bible page, she was born 15 Apr 1887.15 I did not locate a baptism record for her. There is birth record for a Ralphedda Walker, daughter of William, born 16 Apr 1887. It is possible this is our Edna. I would need to see the original record to be sure. She appears in the home of her parents through 1930. In 1940, she appears as a boarder, still living in Philadelphia. The record states she’d been living in the same home since 1935. Edna was employed as a looper in the hosiery industry from at least 1920 and this appears as the occupation on her death certificate. The looper is the person that puts the toes in the hose and closes the toe. Edna never married and died 18 Dec 1964 in Philadelphia.16 While the birth date on the record did not match what we have, her parents were listed and the informant was her nephew Frederick W. Schmitt. She was buried 21 Dec 1964 in Greenmount Cemetery. No obituary has been located for Edna. Frank Orme Walker. Frank was born 15 Apr 189017 and died of Chorea 17 Apr 1898.18 Frank was not found in the birth registrations. Chorea is an abnormal involuntary movement derived from the Greek word “dance.” It is characterized by brief, abrupt, irregular, unpredictable, non-stereotyped movements. He was buried on 19 Apr 1898 in Mount Moriah Cemetery. An obituary is included with the record from the Oliver Bair Funeral Home, but it is not known what paper it came from. The obit was not found in the Philadelphia Inquirer. John E. Walker. John was born 27 Aug 1892. John was not found in the birth registrations. In about 1916, he married Marie Krause (2 Nov 1892 – 11 May 1959), daughter of Ewin A. Krause and Mary Hunsicker. 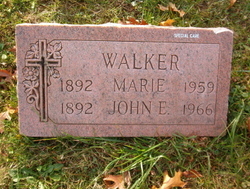 John died in May 196619 in Philadelphia and was buried with Marie on 18 May 1966 in Hillside Cemetery.20 John was missing a leg but I never knew how or when this loss occurred. 2. Elmer Warren – born 4 Aug 1919 and died 31 Mar 1969 in Philadelphia. 16 Nov 1940 he married Nathlie Seabrook Shaud (1923-2010) in Wilmington, New Castle, Delaware. 6. Richard William – born about 1935. WILLIAM HARRY WALKER – 28 Dec 1894 – 12 Nov 1961. Harry will be discussed in a separate post. Ralph Walker. Ralph was born 27 Feb 1898 and died of marasmus on 26 Jun 1898.21 He was interred on 28 Jun 1898 in Mount Moriah Cemetery. An obituary is included with the record from the Oliver Bair Funeral Home, but it is not known what paper it came from. The obit was not found in the Philadelphia Inquirer. Marion Edith Walker. Marion was born 3 Jan 190122 and was baptized 4 May 1913 in Philadelphia.23 She married Frederick William Schmitt (30 Aug 1899 – 2 May 1939) on 21 Apr 1920.24 She married again after 1940 as she appears as Marion Davis in her sister Eleanor’s 1965 obituary. The name of her second husband is yet unknown. She died 1 Jun 1979 and was interred 7 Jun 1979 in Greenmount Cemetery. She and Fred had four known children – only one (Fred Jr.) survived to maturity. 1. Frederick William Jr., 31 Mar 1921 – 28 Sep 1988. He is interred in Greenmount Cemetery. 2. Charles Louis – born 3 Mar 1925, baptized 16 Aug 1925 at St. Mark’s. Charles died 2 Dec 1934 when he was killed by a hit and run driver. It does not appear the driver was ever located. He was interred 6 Dec 1934 in Greenmount Cemetery. 3. Gerald – born prematurely on 13 Jun 1928 and died the same day. He was interred in Belvue Cemetery on 15 Jun. Belvue closed in 1951, and it appears his remains were relocated by Belvue to Philadelphia Memorial Park. 4. Neil – born prematurely 13 Jun 1928, he died on 17 Jun 1928, and was interred in Greenmount Cemetery on 19 Jun. 1. Frances Ruth – Known as Ruth, she was born 17 Jun 1922 in Philadelphia. She married Harold Leonard Meyers (1921-2012). Ruth died 30 Nov 2000 in Spring Hill, Hernando, Florida. 1. Walker Family Bible 1883 – 1902, family pages; Photocopy held by Sharon Scott, [ADDRESS FOR PRIVATE USE,] Tucson, Arizona, Currently. 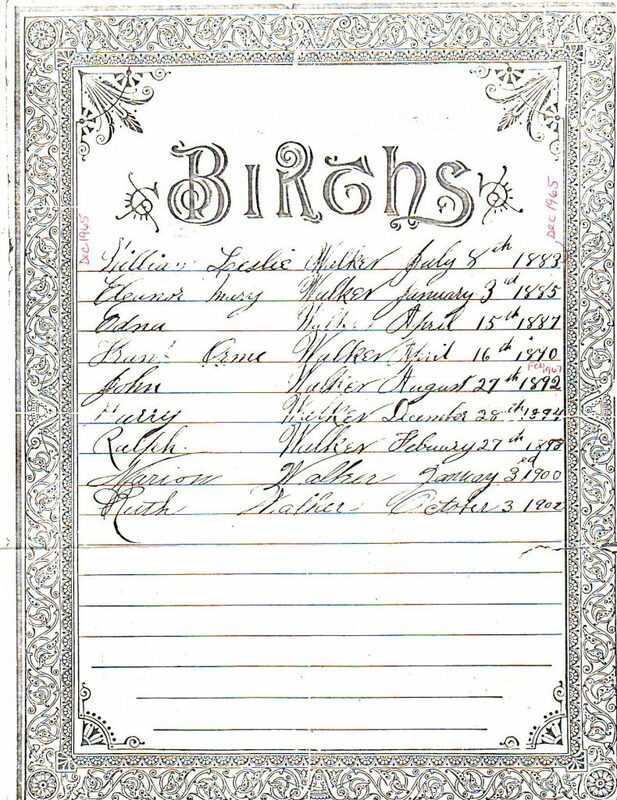 Copy of Birth Page Listing All the Children of William Z. Walker and Nannie M. Heisler. 2. Philadelphia, Philadelphia, Pennsylvania, Bk 1883, p. 235, William Walker; digital image, “Pennsylvania, Philadelphia City Births, 1860-1906,” (1 Jul 2017). 3. Church of the Redemption (Philadelphia, Pennsylvania, Philadelphia County), “Baptism Register,” 13 Sep 1885 Baptism of William Leslie Walker; FHL microfilm 2,048,217, item Birth date in Baptism Register 8 July 1882. 4. 1900 U.S. census, Philadelphia County, Pennsylvania, population schedule, Philadelphia, enumeration district (ED) 284, p. 13B, dwelling 161; digital images, Ancestry (http://www.Ancestry.com); citing National Archives and Records Administration microfilm T623, roll 1458. 5. 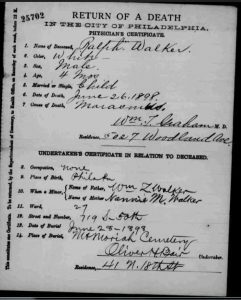 “Cook County, Illinois, Birth Certificates Index, 1871-1922,” database(accessed 1 Jul 2017), Madeline Walker, born 21 Jan 1922, Father William Leslie Walker, Mother Madeline Williams; FHL Film #1379100. 6. 1930 U.S. census, Philadelphia County, Pennsylvania, population schedule, Philadelphia, enumeration district (ED) 965, p. 23B, dwelling 411; digital images, Ancestry (http://www.Ancestry.com); citing National Archives and Records Administration microfilm T626, roll 2118. 7. 1940 U.S. census, Philadelphia, Pennsylvania, population schedule, Philadelphia, enumeration district (ED) 51-1990, p. 1B, household 15, Walker, Harold A 59, Madaleine 40, Madaleine B. 16, Jeanne R 11; digital images, Ancestry (accessed 1 Jul 2017); citing National Archives and Records Administration microfilm T627, roll 3749. 8. Social Security Administration, “Social Security Death Index,” database, Ancestry (http://www.ancestry.com : accessed 9 Oct 2009), William Walker 198-07-0862. 9. 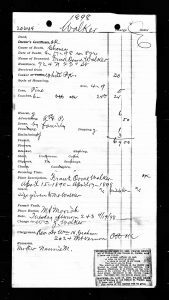 Greenmount Cemetery (Philadelphia, Pennsylvania), Interment Record, William L. Walker, Old Lawn, Lot 451. With William Z. & Nannie Walker. 10. Social Security Administration, “Social Security Death Index,” database, Ancestry (http://www.ancestry.com : accessed 9 Oct 2009), Madeline Walker 204-05-8802. 11. Philadelphia, Philadelphia, Pennsylvania, FHL microfilm 1,289,324, p. 15, bk Jan 1885, Eleanor M. Walker, 03 Jan 1885; digital image, “”Pennsylvania, Philadelphia City Births, 1860-1906,” (14 Jun 2017). 12. Church of the Redemption (Philadelphia, Pennsylvania, Philadelphia County), “Baptism Register,” 13 Sep 1885 Baptism of Eleanor Walker; FHL microfilm 2,048,217, item Birth date in Baptism Register 3 Jan 1885. 13. Funeral Card for Eleanor M. Hirst, died 17 Jan 1965, Collingswood, Camden, New Jersey, A collection of loose personal papers held by Faith Meyers. 14. “Mrs. Eleanor M. Hirst,” Courier Post, 20 Jan 1965, p. 42; digital images(accessed 30 Jun 2017). 15. Walker Family Bible 1883 – 1902, family pages; Photocopy held by Sharon Scott, [ADDRESS FOR PRIVATE USE,] Tucson, Arizona, Currently. Edna Walker April 15th 1887. 16. Pennsylvania Department of Health, death certificate 122135-64 (18 Dec 1964), Edna Walker; Department of Vital Statistics, New Castle. 17. Walker Family Bible 1883 – 1902, family pages; Photocopy held by Sharon Scott, [ADDRESS FOR PRIVATE USE,] Tucson, Arizona, Currently. Frank Orme Walker April 16th 1890. 18. Pennsylvania City of Philadelphia, Philadelphia City Death Certificates 1803-1915, ; digital image, Family Search, “Pennsylvania, Philadelphia City Death Records, 1803-1915,” New Family Search (http://pilot.familysearch.org). 19. Social Security Administration, “Social Security Death Index,” database, Ancestry (http://www.ancestry.com : accessed 9 Oct 2009), John Walker 182-09-9594. 20. “Walker, Johne E.,” The Philadelphia Inquirer, 16 May 1966, p. 46; digital images(accessed 1 Jul 2017). 21. Pennsylvania City of Philadelphia, Philadelphia City Death Certificates 1803-1915, Bk 1898: 97, Ralph Walker; digital image, Family Search, “Pennsylvania, Philadelphia City Death Certificates, 1803-1915,” New Family Search (http://pilot.familysearch.org: 1 Jul 2017). 22. Philadelphia, Philadelphia, Pennsylvania, Bk 1901, p. 53, Marion Walker; digital image, ” Pennsylvania, Philadelphia City Births, 1860-1906,” (1 Jul 2017). 23. “Pennsylvania, Church and Town Records 1708-1985,” Marion Walker, born 3 Jan 1901, baptized 4 May 1913, age 12, Simpson Memorial United Methodist Church, Parents William and Nannie Walker; digital images, Ancestry (http://www.ancestry.com). 24. “Pennsylvania, Church and Town Records 1708-1985,” Marriage Marion Edith Walker to Fred William Schmitt, 21 Apr 1920; digital images, Ancestry, “Simpson Memorial United Methodist Church,” (http://www.ancestry.com : accessed 1 Jul 2017). 25. Philadelphia, Philadelphia, Pennsylvania, Bk 1902, p. 235, Ruth Walker; digital image, “Philadelphia, Philadelphia, Pennsylvania, Bk 1901, p. 53, Marion Walker; digital image, ” Pennsylvania, Philadelphia City Births, 1860-1906,” (1 Jul 2017).,” (1 Jul 2017). 26. “Pennsylvania, Church and Town Records 1708-1985,”Ruth Walker, born 3 Oct 1902, baptized 4 May 1913, age 10, Simpson Memorial United Methodist Church, Parents William and Nannie Walker; digital images, Ancestry (http://www.ancestry.com). 27. Family Search, “Pennsylvania, Philadelphia Marriage Indexes, 1885-1951,” database, Family Search, Family Search (http://search.labs.familysearch.org : accessed 16 Sep 2009), Ruth Walker and William H. Schoenleber, 1922, Lic #455486. 28. Pennsylvania Department of Health, death certificate 32550 (23 Apr 1942), Ruth Schoenleber, born 3 Oct 1902, Father Wm. 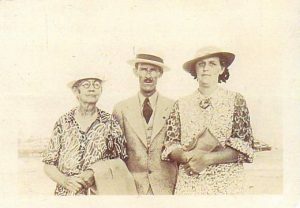 Z. Walker, mother Nannie Heisler, husband Wm H. Schoenleber, age 42; Department of Vital Statistics, New Castle.